*I haven't eaten chocolate in over a month. It gives me heartburn right now. *I only went trick or treating with Jay for one block because I felt too sick to go any farther, so John took over. *When we found out John's debit card information had been stolen, (a movie theatre in Loveland got hacked) I didn't check the balance right away...then our bank switched computer systems and shut down for 3 days, and now I can only see transactions from the last 2 days. Thank goodness the people at the bank canceled his card and said they didn't see any fraudulent activity. Hopefully were in the clear. *I have not cooked more than twice a week for the last 3 weeks. Thank goodness for frozen pizza, PB&J, mashed potatoes, canned vegetables, and ready-made-food from the grocery store. *I really wanted a snow day today. We got over nine inches of snow last night. Too bad I had school, it would have been fun to chill with Jay. *I bought Jay a baby carriage and a cabbage patch doll from a garage sale a few weeks ago. He pushes it around until I make a crying sound, then he brings the doll to me for me to comfort it...and then takes it back. *I have loved the taste of grapefruit lately. It is so sweet (and on sale) this time of year. *My husband is amazing. He has cleaned the house (including sweeping and vacuuming) on his day off every week lately. *I can't decide if letting Jay climb on things is a battle worth fighting or not. Of course he is not allowed to climb on tables or places where he gets into big trouble, but chairs and couches seem to be pretty harmless so far...I think. *I am so thankful for my neighbors and their friendliness and helpfulness. 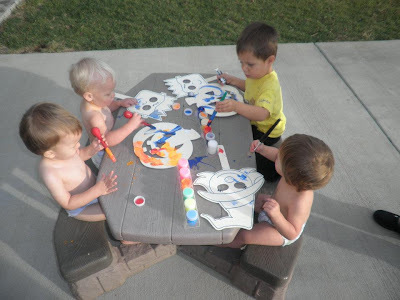 When I was sick a few weeks ago and John was busy doing sprinkler blowouts, they had all the kids outside painting a craft project in their diapers. The kids are 13 months, 16 months (Jay), 20 months, and 3 years old. How fun. *We are pregnant and we got to see the little baby and the heartbeat in an ultrasound today! I am 11 weeks (12 wks on Friday), and will be due May 22ish. I am definitely sick, but since I have nausea pills and have forced myself to eat more often I am managing a bit better than last time. I was more worried this time around, but after today's appointment I am really excited. John is excited too, and Jay has no idea what is going to happen. Yay! Congratulations! Hope this one goes a little more smoothly than it did with Jay! Yay for the new baby and getting to see the little critter! SO very excited for you guys! Do you listen to Pregtastic (podcast via iTunes)? They had a show on how to deal with nausea (although if you require meds, I'm sure you're past that ;-)) but also loads of other fun topics.